I reported on the possibility of Alexis Sanchez becoming a Manchester United player several months ago and he has himself declared his wishes to become a United player. The 20-year-old Chilean striker has become one of the most promising youngsters in Italian football, due to a number of impressive performances as Udinese’s number 11. His nickname is "El Nino Maravilla" (The Wonder Boy), several high profile clubs within Italy and from around Europe have been taking a long hard look at him but his ambitions lie with Manchester United. He began his professional career with the Chilean club Cobreloa. He played one season there before being signed by the Serie A team, Udinese. Udinese had to pay nearly $3 million for his signature. Colo-Colo then paid Udinese nearly $150,000 for his services in the upcoming Clausura tournament and the following Apertura tournament in the Liga Chilena. He scored his first goal with Colo-Colo in the Copa Sudamericana 2006 against the Liga Deportiva Alajuelense on October 10 2006 in the David Arellano Stadium. On March 12 2007,Sánchez hurt his toe and there were major fears that Sánchez's career may be over. On March 20 2007 Sánchez made a miraculous recovery from his bad toe and scored a hat-trick in a Copa Libertadores group match versus Caracas. On August 15, 2007 he was signed to River Plate on loan. 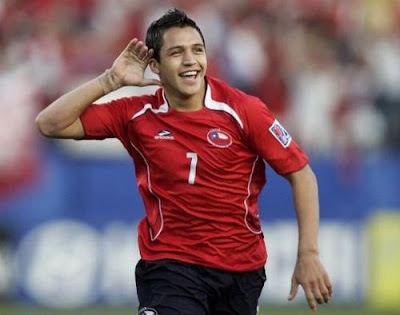 Udinese has Alexis Sanchez valued at 20 million euros.